Description: Light brown to gray in color, with pale legs and a black bill, this is a robin-sized plover. During the breeding season, a white forehead and supercilium, black marking on its forecrown and black lores add color. The light wing patch on top of extended wings and black-edged tail band are present in all plumages. 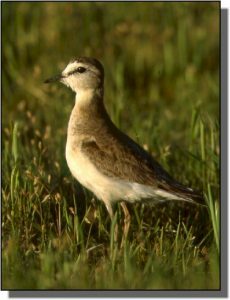 Similar Species: Other species of large plovers are often misidentified as Mountain Plovers. Unlike Killdeer, Mountain Plovers never have a breast band. Nonbreeding golden-plovers and Black-bellied Plovers are larger in size and speckled above. Comments: Well camouflaged by both coloration and behavior, Mountain Plovers aptly earn the nickname “prairie ghost.” They are found in open short grass or bare areas such as prairie dog colonies, bare agricultural fields and freshly burned prairies. Numbers have decreased due to habitat alteration. Within the Great Plains, they nest in arid western prairies and are seldom seen in the central or eastern parts of this region.